Kofi has an extensive corporate communications experience in the social enterprise sector, technology and media industries. He has worked on the delivery of communications strategy through planning, development and the delivery of internal and external communications and managed marketing initiatives. He has deep knowledge about developing marketing concepts and a thorough understanding of the lives of low income consumers in developing markets, which are of increasing importance to an organisation. Are you a young person looking to create change in your community and want to make a difference across Ghana? Do you want to make an impactful and sustainable change? Digital Opportunity Trust (DOT), in partnership with GhanaThink Foundation, is pleased to announce the the Ghana Youth Social Entrepreneurship Programme. We are calling out to youth as partners for the implementation of their ideas which are geared towards “Social Innovation that Works for Women”. This application does not restrict innovations to be focused on women as a primary beneficiary only, so all ideas with a social innovation focus are welcome. This challenge is seeking youth as agents of community development through social enterprises. As an applicant, you must be passionate about social entrepreneurship, social innovation and be willing to create social change. Receive cutting-edge coaching and mentorship support to develop your own innovative social businesses. Selected participants will go through a 4-months training on how to develop their social enterprise ideas using human centred design approach. Selected participants will receive both financial and non-financial support to test and implement their ideas . The final selected participants will attend the global DOT Unconference in Nairobi, Kenya in October 2018. You will get the chance to pitch your ideas after the training. Should have a valid passport or able to acquire a passport within a short period. Have an innovative solution to a community problem which is at the early ideation stage. If you have been thinking through an idea which has a social impact, then you can apply. Applicants with gender focused ideas are encouraged to apply. Applicants must be committed and available throughout the programme to attend trainings and workshops. Young women are highly encouraged to apply. You will be awarded after your training. You will have fun with awesome people. Step 1: Take time to research what a social innovation or social enterprise is to help clarify your social innovation idea. If selected, you will be required to attend a compulsory meetup with all the other selected participants between June 28 – 30 2018 or July 1 2018. You Don’t Know What Books to Read in 2018? Do Not Worry, My Friends Got a List For You. Every new year, I would search on Google for articles that recommend books to read for the new year and then I will select some of them and add it to my booklist for that year. I prefer to read hard copy books to e-books, this is more of a personal decision, it makes me finish and act on what I read because I invested money into buying them. This year, I did something different, I asked my friends on Facebook and some selected Whatsapp groups to share with me their favourite books they read in 2017. So, if you are wondering what books to read for this new year, then check out what my friends recommended as their favourite books in 2017. The Most Important Person on Earth. Author – Dr Myles Munroe. Create Your Own Future. Author – Brian Tracy. The Unconscious, The Conscious And Super Conscious. Think Big. Author – Ben Carson. Change your brain, Change your life. Author – Dr Daniel Amen. Rich Dad, Poor Dad. Auhtor – Robert Kiyosaki. Rules of Money. Author – Richard Templar. Cashflow Quadrant. Author – Robert Kiyosaki. Sacred Hoops. Author – Phil Jackson. Guapa. Author – Saleem Haddad. The purpose and power of man & The purpose and power of woman. Author – Dr Myles Munroe. Battlefield of the Mind. Author – Joyce Meyer. The Power of your words. Author – Don Gosset. Living without Fear. Author – Don Gosset. Kingdom Parenting. Author – Myles Munroe. The Fatherhood Principle. Author – Myles Munroe. The Spirit of Leadership. Author – Myles Munroe. Managing your emotions. Author – Joyce Meyer. Seeking Allah, finding Jesus. Author – Nabeel Qureshi. I am very sure you will find one of these listed books interesting and add it to your booklist for 2018. Wishing you all the best in 2018. Johannesburg, South Africa: Internet shutdowns in Sub-Saharan Africa have cost the region up to US$ 237 million since 2015, according to a report to be released by the Collaboration on International ICT Policy for East and Southern Africa (CIPESA). Using a newly developed framework, the report estimates the cost of internet shutdowns in 10 African countries, and notes that the economic losses caused by an internet disruption persist far beyond the days on which the shutdown occurs, because network disruptions unsettle supply chains and have systemic effects that harm efficiency throughout the economy. Do Young Ghanaian Entrepreneurs Build Start-ups to Survive or to Create Impact? Few weeks ago, I had a very interesting conversation with Sesinam Dagadu, a well respected young Ghanaian tech entrepreneur and creator of the Snoocode navigation app, about the start-up ecosystem in Ghana. I asked of his views on why many promising start-ups spring up in Ghana, but go extinct in about 3-5 years of operation. Why do many promising start-ups spring up in Ghana, but go extinct in about 3-5 years of operation? He said, “you know what? Many young Ghanaian innovators innovate to survive. In other words, they are motivated to innovate to be able to provide food and shelter for themselves and their families. They don’t innovate only because they have the passion for what they are doing or to help solve societal problems”. Perhaps this is the reason why Ghana receives less funding for the start-up ecosystem than its sister country Nigeria. 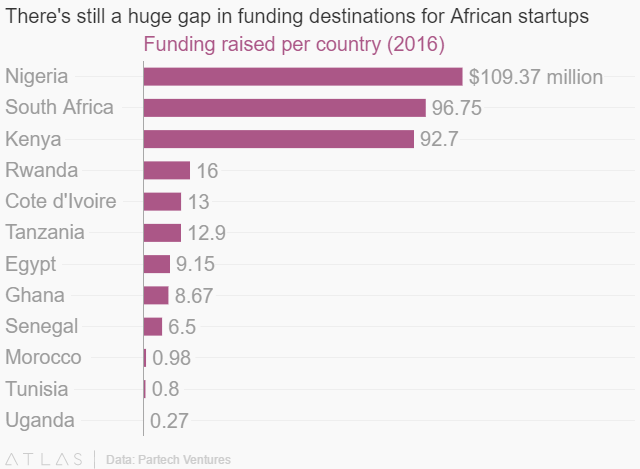 In 2016, according to a report released by Partech Ventures, Ghana received about $8.67million as total investment raised by start-ups as compared to a whooping $109.37 million raised by the Nigerian ecosystem. Has the media and conferences been helpful? Many believe that most innovations or startups in Ghana don’t thrive because they are mostly motivated by the “wrong reasons”. Another factor for failure of these startups is what I call the “unnecessary media hype”. Many young folks build start-ups to get the “media and conference panelist” recognition. Many of these young folks don’t have the patience to build a working model which will yield extreme long term benefits, but prefer to do a quick fix for short term recognition and then phase out after the media hype shifts to another start-up. In a Facebook interaction with Kobby Blay, a nurse and founder of GhanahealthNest.com, he indicated that the media is to blame for poor work done. He said, “May be we should share the blame of the ‘unnecessary media hype’ to the media persons, who fail to do proper probing”. Many seasoned entrepreneurs believe that, young entrepreneurs build products to showcase at conferences without any sustainable plan. Francis Birikorang, co-founder of AgroCenta, also stated that “the hype will take you there, due diligence will bring you back empty handed”. Other people are of the view that the media plays a critical role in helping start-ups in Ghana succeed. “They could have the motive of survival and that is not wrong. They could get media hype and that is ok. If they had the safety net, capital and efficient incubator hubs with business support and advisory services, most of them will turn out very ok. They do the media and attend conferences for visibility, hoping it will land them the right networks and capital.” says Ms. Louise Clara Donkor, former SRC President at the University of Ghana. “Africa is a very green territory and mostly innovators don’t go looking for media but media comes to them since they happen to fall in a unique spot. if local media finds you in your early stage, due to ignorance in the field, they may hype you in a way that annoy those who know.. but who do you blame? Ignorance! But then, all these are good and have to happen for the ecosystem to grow. Start a game company now and CNN will find you.. why? because it’s new in the territory (but not in the world). After 10 years, it wouldn’t be new anymore since a lot more would have been done by us the early birds and due to the encouragement instilled, more game developers would have been made” says Eyram Tawiah, co-founder of Leti Arts. No Market for the Start-ups? Is the non-existence of a ready market to buy the products of these start-ups the primary reason for their failure? The President and founder of mPedigree, a mobile application technology that is able to identify fake products by texting a 10-digits to a short code, Bright Simons, argues that, ” I am now on the side of those who believe “markets are everything”. The primary reason for failure is the simple absence of a market for the product. Without a market it doesn’t matter if the team is made up of Ford, Jobs and Dell, it will fail. If a market exists, even a mediocre entrepreneur will crack a reasonably workable model of making money. I have advised enough big companies now to conclude finally that “creating new markets” often simply mean “hijacking old markets”. However, there is another school of thought that believes that start-ups can create a market if there is none. Ekuonana Omane argues that “not only existing markets but the ability to create one. Most people don’t know they need a service or product until you effectively brand and market that service or product. Below are some of the responses I got on the subject matter. These response have been categorised under the various sectors indicated by the respondents. About 43% of people in charge of social enterprises are between the ages of 25 and 34. The 98 surveyed social enterprises have created a total of 958 jobs (based on staff numbers in 2015), have impacted the lives of 103,148 beneficiaries and have generated a combined turnover of £1.4 million (almost 8 million cedis) in the last year and about 66% of them are full time employees. Almost all social enrterprises anticipate increase in the number of staff, growth in their venture and about 77% increase in turnover in the coming year. Almost “60% of the social enterprises in Ghana focus on creating employment opportunities, expand into new geographic areas, attract new customers or clients, attract investment to expand, increase sales with existing customers and win business as part of a consortium. There are two main sectors in Ghana that social enterprises work in, they are, education and agriculture with education social enterprises being particularly dominant in Accra and agricultural social enterprises most common in the North. However, the education sector tops followed by agriculture, manufacturing, services, retails and housing. The top sector that social enterprises work in is education. According to the study, “based on the very small unrepresentative sampling process, there may be as many as 26,000 social enterprises currently operating in Ghana, with growth expected.” One of the major barriers faced by surveyed social enterprises in Ghana is financial and over two-thirds see difficulties to obtain grant funding as problematic. Other barriers stated in the survey include, cash flow, lack of access to support and advisory services, understanding/awareness of social enterprise among banks and support organisations and shortage of technical skills. Is there a policy in Ghana supporting social enterprises? According to the survey, “there is currently no legislation in Ghana directly mentioning or supporting social enterprises. However, social enterprises are impacted by existing legislation.” The study also suggested insight into where legislative change could support social enterprise development. There is no category for social enterprises to register themselves as in Ghana. The legal forms available to social enterprises in Ghana has sole proprietorship as the most commonly used among social enterprise survey respondents (38%). To help develop policies that will supoort the work of social enterprises in Ghana,the British Council is now working with a technical consultant (from Social Enterprise UK), the Social Entrepreneurs Ghana Network (SE Ghana) and MoTI to develop a social enterprise policy. This study was led by Emily Darko (initially at ODI then UnLtd) with support from Shelagh Whitley and Richard Hughes (ODI), and conducted and written up in partnership with Social Enterprise UK (SEUK – team led by Nick Temple, with Dan Gregory, Martin Cooper and Charlotte de Ruyver), Betterstories (team led by Minhaz Anwar, with Anhar Athoi, Farhana Islam and Muhaimin Khan), Social Innovation Lab at Lahore University of Management Sciences (team led by Maryam Mohiuddin Ahmed, with Saad Idress and Arslan Khalid) and Songhai Advisory (team led by Kissy Agyeman-Togobo, with Lord-Gustav Togobo, Courage Kweson and Emmanuel Amoah-Darkwah). For the full report, please read here. CowTribe, the pioneering startup behind Ghana’s first ever Crowdsourced Livestock Disease Surveillance system is a finalist in Pitch AgriHack 2016. Pitch AgriHack aims at accelerating e-agriculture entrepreneurship for improved livelihoods and food security. It targets startups founded by young entrepreneurs aged between 18 and 35 years, from Africa, Caribbean and Pacific countries. For the past months, 20 judges went through 152 applications received (from 29 ACP countries), 52 semi-finalists from 16 countries to determine startups which will be named finalists of Pitch AgriHack, a youth e-agriculture startup support program of the Technical Centre for Agricultural and Rural Cooperation (CTA). So far more than 20 judges have gone through the applications (two screening processes) to determine the 25 finalists. CowTribe a social enterprise founded in 2015 and based in Tamale is pioneering a powerful solution which will radically alter the way we respond to infectious diseases in local communities by placing monitoring and reporting power in the hands of smallholder farmers who until now been seen only as victims. CowTribe has developed a simple, farmer-friendly, mobile application that enables millions of farmers to monitor and report real-time suspected livestock disease outbreaks in their communities and quickly report through their mobile phones. What the company does at the backend is to aggregate the data and then provide valuable information back to farmers and veterinarians regarding animal health in their geographic region to enhance their situational awareness and aid prompt response before to avoid catastrophes. Starting with just farmers in two communities in 2015, CowTribe now operates in 63 communities across two regions in Northern Ghana, linking over 4,000 happy subscribers to critical information that is making local farmers more resilient towards livestock disease outbreaks. The platform currently receive, aggregate and analyse more 200 bits of disease surveillance information from farmers every day and the number keeps increasing month by month. CowTribe will be participating in the training and pitching sessions in Nairobi, Kenya from 22 – 24 November, 2016 and will have the opportunity to pitch their solutions to development partners and potential investors. For more information, visit www.cowtribe.com and follow on Twitter @cowtribe. There are many users of internet based platforms, like Facebook and Google, who are unaware of the existence of the terms and conditions that are available on the platform websites for users to familiarise themselves with and understand. The terms and conditions outline what is expected of both parties in agreement and also what both parties can and cannot do including with private data. Whose responsibility is it to popularise these often long policies to users? As part of the panel discussion on transparency and accountability of intermediaries at #FIFAfrica16, Ebele Okobi, Head of Public Policy, Africa, Facebook, stated that “terms of service are the main mechanism used by companies to communicate with customers. Read them”. In other words, it is the responsibility of the user to read and understand what the terms of service say. However, most users do not read the terms of service “before clicking accept” and as pointed out by Anriette Esterhuysen of the Association for Progressive Communications (APC), firms hide behind that user ignorance to achieve their strategic goals at the detriment of user privacy. Do Terms of Service Govern the Relationship? “Terms of services do not govern the relationship between users and the company,” noted Ms. Okobi. She added that terms of service are the mechanism by which companies communicate with their users on the product. This implies that a firm can take an action that will affect a user with or without his/her permission. Terms of services need to be in clear language and displayed boldly for users to read and understand. Internet-based firms should also consciously create awareness about the importance of reading the terms of services and also interpreting them to users. The firms should take the first step in explaining to users what the terms of services actually mean and what are they agreeing to for using the products. Terms of service should be simplified for users to understand the risks involved in signing up onto a platform and also outline how their data will be collected and used. Meanwhile, users need to understand the rights they are giving up to internet-based firms when they check the “I agree” box on terms of service. On an ongoing basis, companies need to communicate with users to help understand why they need to collect their information and assure them the data being collected will be secured and not shared with third parties without their consent.